Amongst all the Wine & Spirits importers and distributors in New York that I worked with over the last 8 years, about 200-250 approximately, only a few in my opinion can claim to offer a solid portfolio of authentic and expressive, Terroir oriented natural wines (Biodynamic, Organic, “biologique”, sustainable culture, “Lutte Raisonnée”, etc..) from small, artisanal producers all around the world that are not necessarily branded and overly commercial. Amongst them, Rosenthal (Madrose), Louis/Dressner, Kermit Lynch, Peter Weygandt (Weygandt-Metzler), Jenny and François (World Wide Wines), Terry Theise, Liz Willette, Savio Soares, Becky Wasserman, Martine’s wine, Alain Juguenet, Jan D’Amore, Moonlight Selection, Wineberry, Little Wine Company, Baron François, the Wine list, Bayfield and few more, lead the pack as fine examples of consistency and set the standard with their high quality hand-and-palate selected wine lists. Therefore, to share my love for brighter and crispier wines, like those from the Loire Valley for example, and also to continue my eternal quest to introduce you to fairly unknown, under the radar and rather undiscovered wines, grape varieties and regions, I would like to come back to a Domaine imported by one of my favorite importers, Rosenthal (MadRose), that I first tasted a few years ago and that has since always been very consistent in quality and delivered excellent juice vintage after vintage: Domaine Philippe Gilbert Ménetou Salon. The Domaine is located in Ménetou-Salon, a small village about 21 kilometers northeast of Bourges and 32 kilometers southwest of Sancerre, in the eastern Loire Valley, also called the Central vineyards region (due to their central position in the center of France). 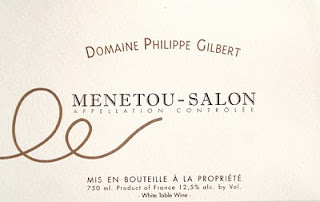 An AOC since 1959, neighboring Sancerre and Pouilly Fumé to the southwest, Ménetou-Salon may not have the same prestige or the notoriety as its neighbors, yet the appellation constantly produces great Sauvignon Blanc and Pinot Noir based wines that can easily rival and offer as much complexity as the ones from the more reputed cited above Appellations. Both Ménetou Sauvignon Blanc and Pinot Noir wines may not be as complex due to the difference of soil’s composition and components compared to Sancerre or Pouilly, but still offer a great deal of layers and taste for usually equal or less money. Sauvignon Blanc wines represent 60% of the production and are often a great substitute to Sancerre and Pouilly-Fumé. And the Pinot Noir wines are of superior quality that rival and sometime surpass the ones from Sancerre. 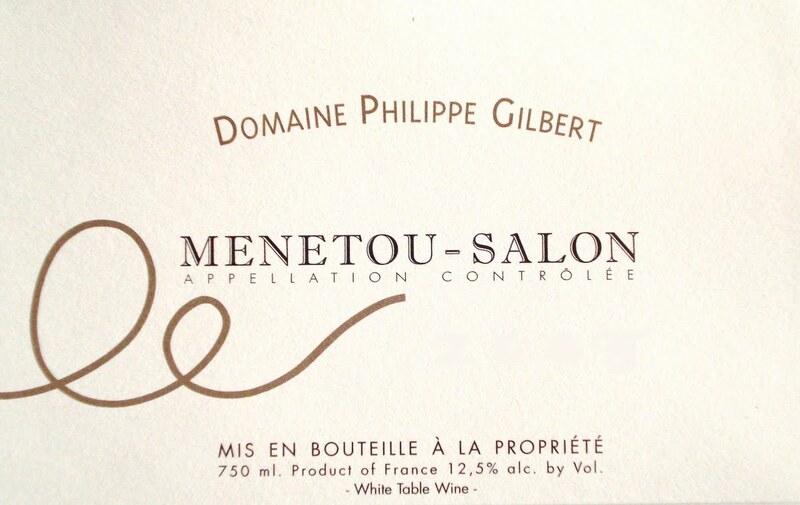 Both are grown on vines planted on chalky-clay-limestone hillsides, which confers essential minerality to Ménetou-Salon wines. (FYI: two other great Loire Valley Appellations to consider for enjoyable Sauvignon Blanc wines that won’t hurt your wallet, are Quincy and Reuilly, further southwest from Ménetou Salon). Domaine Philippe Gilbert encompasses 27 hectares of vines, which are the fruit of a long familial history since 1768. While succeeding his father in 1998, Philippe Gilbert decided to follow the family traditions with the complicity of Jean-Philippe Louis, a very competent oenologist. Both young and talented, they decided to increase the quality and move toward environment oriented vineyard and cellar management and healthier wines by introducing Biodynamic culture to the entire Domaine in 2006. Together they defined objectives about the vinification and the soil to obtain the best expression of the appellation. After years of experience with the vineyard’s environment and the terroir (the vines and especially the soil), the vineyard has been converted to the principles of biological farming, with an individualized Biodynamic management for each of the seven parcels. A systematic mechanic “Binage” is ensured periodically in each of the seven parcels. This action of breaking the hearth (or ploughing) to aerate it and to avoid the bad weeds, facilitates natural drainage of precipitation, restitutes the macrobiotic complexity of the soils and helps the roots of the vines to expand deeper. In addition, a careful control of the budding assures a good distribution of the grapes. A methodic green harvest of the Pinot Noir and Sauvignon optimizes the phenolic maturity of the fruit. The attention to details allows today the Domaine to offer unique wines of a rare quality. The wines of the Domaine are characterized by their elegance and their consistency. The wines tell the story of the men and the women involved with the high quality work achieved in the vineyards and the cellar. Vinification usually and mainly occurs in stainless steel, except for "Les Renardières". Domaine Gilbert produces the Domaine traditional cuvée in white, red and rosé, and a premium cuvée made out of older vines called “Les Renardières” in white and red. The cuvée Domaine, in white and red (sometimes Rosé), more traditional, affords wines distinguished by their freshness and balance. The cuvée Les Renardières, in white and red, made in casks from the oldest vines of the Domaine, offers complex and powerful wines. The whites come from series of parcels encompassing about 11 hectares of vineyards spread throughout the appellation, around the towns of Menetou-Salon, Vignoux, and Parassy. The vineyards are planted on part of the Kimmeridgian band that stretches from this eastern section of the Loire south of Sancerre up to Champagne. The reds are from multiple parcels totaling about 12 hectares, situated in the above-cited 3 communes plus parcels in Morogues. Total production of each wine is about 100,000 bottles per year (8,000 or so cases of 12). The 2005 and 2006 vintages were already benchmarks of the appellation, and the 2007, although not as ripe is far from being a disappointment or a lesser wine. It is simply different with less ripeness of the fruit, yet it possesses great balance, beautiful acidity and gentle tannic structure. The nose is discreet, fresh and floral, with nuances of freshly crushed cherry and red fruit with mineral notes. Behind its beautiful, bright pale ruby hue, it offers a palate of great complexity and ample elegance. Bright red cherry and red fruit flavors awaken your taste buds in the mid-palate complemented with slight earthy hints. The finish is refreshing and well structured combining a lovely acidity with minerals notes and integrated tannic structure. Overall, it is a very well crafted example of Pinot Noir from an up-and-coming appellation, which strangely enough lack of reputation, yet should attract more attention from both connoisseurs and amateurs. Ideal with white meat and poultry, it will also finely complement any fish and Loire goat cheeses. Info partly taken from the winery website at www.domainephilippegilbert.fr and from previous articles that I wrote about this particular winery and its wines.